The Rock is unstoppable. His most recent superhuman feat has even been recorded in the Guinness Book of World Records. What remarkable talent hath the God of Cod bestowed upon us mere mortals now, you ask? He set the record for taking the most selfies under three minutes. Take that, Kimmy K.! 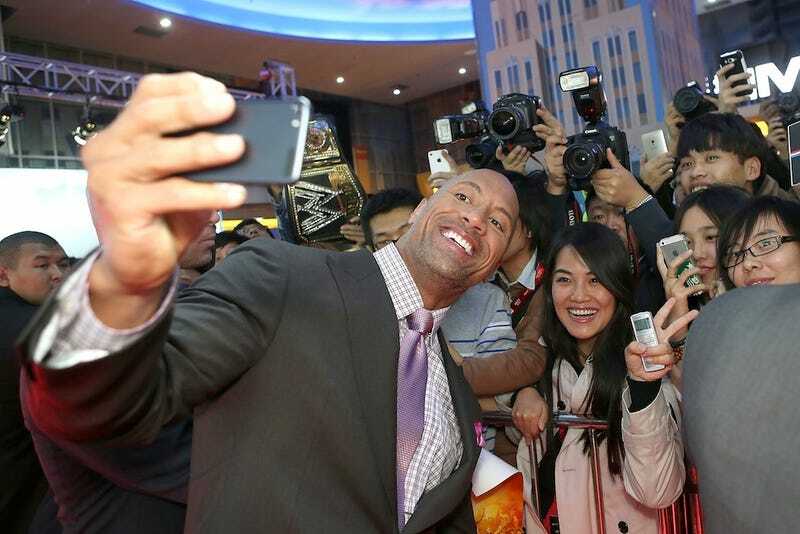 The Renaissance man of our time took a total of 105 selfies at the London premiere of his new film, San Andreas. A GWR official was onsite to make sure every selfie was legit, reports People. There are very specific rules for record-breaking selfies, such as full faces and necks must be in the photo and the image has to be in focus. “We just set a NEW GUINNESS WORLD RECORD for most self-portraits (selfies) taken in record time (yup, a selfie world record exists and your arm gets a helluva workout),” The Rock wrote on his Instagram. A HELLUVA WORKOUT HE SAYS.